390. Device for converting oscillating into rotary motion. 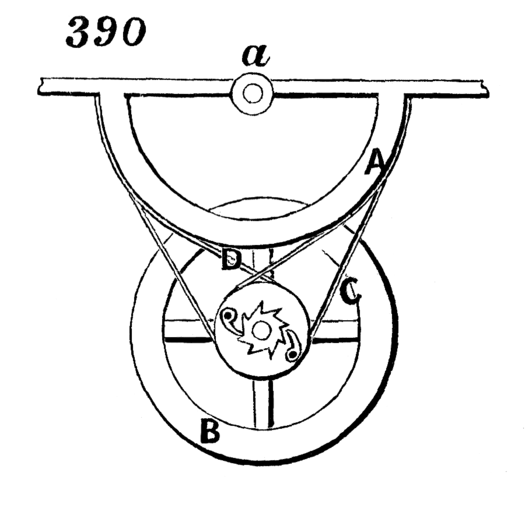 The semicircular piece, A, is attached to a lever which works on a fulcrum, a, and it has attached to it the ends of two bands, C and D, which run around two pulleys, loose on the shaft of the flywheel, B. Band, C, is open, and band, D, crossed. The pulleys have attached to them pawls which engage with two ratchet-wheels fast on the fly-wheel shaft. One pawl acts on its ratchet-wheel when the piece, A, turns one way, and the other when the said piece turns the other way, and thus a continuous rotary motion of the shaft is obtained.